Library image #1947: Early morning Alpenglow on range in Mt. Mendel Kings Canyon National Park. The United States Congress designated the Sequoia-Kings Canyon Wilderness (map) in 1984 and it now has a total of 768,222 acres. All of this wilderness is located in California and is managed by the National Park Service. 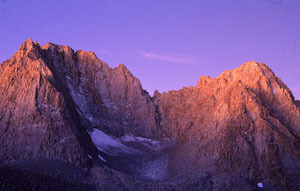 The Sequoia-Kings Canyon Wilderness is bordered by the John Muir Wilderness to the north and east, the Monarch Wilderness to the west, the Golden Trout Wilderness to the south, and the John Krebs Wilderness to the south. Sequoia National Park, America's second oldest park, was eventually joined with Kings Canyon National Park to form an area described only with multiple superlatives, a parkland of which everything off the beaten track has been designated Wilderness. Here in the heart of California wildland, almost surrounded by other designated Wildernesses, you'll find some of the most glorious scenery on Earth, a world of high peaks, deep canyons, lush meadows, bright lakes, rushing rivers, sparkling streams, and big, big trees. To the west, the park descends to dry foothills of oak and chaparral toward the San Joaquin Valley. To the south runs the Middle Fork of the Kaweah River, as well as the Wild and Scenic North Fork of the Kern River. To the east stands the crest of the Sierra Nevada and the highest mountain in the Lower 48, Mount Whitney at 14,500 feet, shared with John Muir Wilderness. Across the heart of the area runs Kings Canyon at depths virtually unparalleled, prompting John Muir to dub it "a rival to Yosemite." It is cut by the Wild and Scenic South Fork of the Kings River, which flows out of the park to meet with the Wild and Scenic Middle Fork of the Kings River. Fishing for rainbow, brown, brook, and golden trout can be outstanding in the Kings River, in the forks of the Kaweah, and in high-mountain lakes and streams. Even if the fish aren't biting, the scenery is worth the trip. Traveling north-south, 101 miles of the Pacific Crest Trail and 97 miles of the John Muir Trail cross the heart of the wilderness. Numerous other trails provide access to much of the wonders of the area. Planning to Visit the Sequoia-Kings Canyon Wilderness? How to follow the seven standard Leave No Trace principles differs in different parts of the country (desert vs. Rocky Mountains). Click on any of the principles listed below to learn more about how they apply in the Sequoia-Kings Canyon Wilderness.